January. A month filled with good intentions for the Anyfish team. The post Christmas tum is still a little larger than we’d like, we’ve considered (and as usual, decided against) the trial gym membership and the corkscrew has been locked securely away for the forseeable future (though it'll probably be allowed out at the weekend). The one thing that won’t change is that we’ll still be cooking up plenty of delicious fish focused meals because we know that fish is a thoroughly healthy supper solution (as long as it’s not just the kind that’s deep fried and served with a stack of thrice cut chips, however much we love it that way). But hang on a minute… perhaps this is a good moment to recap exactly why fish is so flippin’ fabulous, just because knowing the detail means we can feel even better (and even a bit smug) about how thoroughly healthy we’re being every time we tuck into a delicious plateful of the ocean’s finest. Fish is essentially a high-protein, low-fat food. In fact, the white fleshed kind is lower in fat than any other source of animal protein, whilst still being hearty and satisfying. 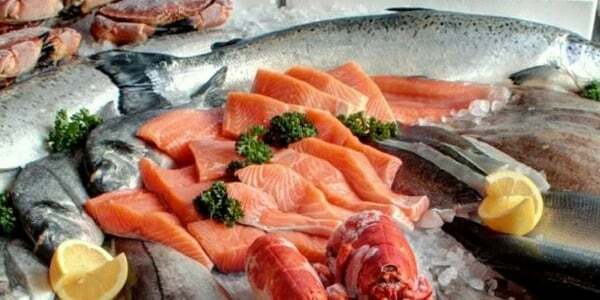 Fish can provide us with a very useful range of health benefits too and that’s why health experts recommend that we eat fish at least twice a week. Fish fact #1. Fish can help maintain a healthy heart... Research has shown that if you eat fish twice a week, you can reduce your risk of heart disease by 30%. This is basically because ‘good’ omega-3 fats which are found in oily fish will reduce levels of ‘bad’ triglyceride fats in your blood. This is brilliantly beneficial because it is the triglycerides that cause blood clots and which can in turn lead to heart attacks. If this isn’t impressive enough, omega-3 can also help to lower blood pressure which helps to make life a little bit easier for your heart. Definitely a good thing. Fish fact #2. Fish can boost your body’s energy production… The fatty acids in fish are one of the best contributors to energy production which means they can increase both your physical and mental capacity (brains and brawn - excellent). Eating plenty of fish can help you stay alert and improve your concentration levels too and isn’t life much easier when you’re firing on all cylinders? Fish fact #3. Fish can keep your brain and nervous system healthy… Omega 3 has been proven to help prevent Alzheimers disease and to reduce signs of schizophrenia, depression, anxiety and stress so eating plenty of fish is just the thing for keeping mental wellbeing and happiness right on track. Fish fact #4. Fish is good for your skin and hair... A diet that’s rich in fish can help to make you look younger (yes really). Another benefit of fish oil is that it helps increase your body’s production of collagen which in turn helps keep skin wrinkle-free. For long, glamorous tresses omega-3 is a must too (we’re still hopeful) as it’s the collagen boosting factor which leads to healthier and faster hair growth. A pretty impressive selection of benefits when you look at it like that, especially when you also consider how naturally low in fat fish is too. There are loads of different varieties of fish available all year long which are all packed with omega-3, full of essential protein and which taste delicious simply steamed with a good selection of veg or spruced up into an exotic salad, hearty stew, scrumptious pasta sauce or as an impressive dinner-party showstopper. If you pop into our Anyfish fishmonger shop, Stu can suggest some of the best, seasonal and sustainable fish to incorporate into a healthy diet. He’s full of bright ideas for recipes too so if cooking fish is a little bit alien to you then don’t worry, we can come up with something simple as well as scrumptious. Mackerel, salmon, tuna and sardines are the kings of omega-3 but there are plenty of other options to choose from too. The other great place to find out about all things fishy is fish is the dish . There’s a really handy guide to all the different types of fish and what they’re good for plus a multitude of fish recipes from sandwiches and snacks through to starters and suppers. There are loads of low fat healthy recipes on there so if you’re keen to drop a few pounds but still want to enjoy what you eat, it’s well worth a browse about. In the meantime, maybe we’ll see you in the Anyfish shop. We’ll be the extremely cheery ones with the high energy levels and incredibly youthful skin. PS. The recipe photos are all from the excellent Seafish website www.fishisthedish.co.uk.